Design a front cover for Fusion Flowers magazine. 1 This must be your own, original work using only fresh and/or dried plant material. 6 Only designs of a suitable standard will be posted on our Facebook page - please be aware that we are known for cutting edge floral design worldwide and have won many awards for our covers. 7 The competition is open to all but no work will be published unless the editorial team feel it is of a suitable standard. 12 All entries MUST be sent via private message to our main Facebook page. 13 Editors decision is FINAL! Remember only entries made via Facebook private message will be accepted! Medinilla is native to the mountainous regions of the Philippines, where you can find more than 200 different species. The plant is called Kapa-kapa in the Philippines. There are more than 400 species worldwide, particularly in Southeast Asia, around the Pacific and in tropical Africa. Medinilla grows in trees as an epiphyte - that means that the plant does not draw any nutrients from the host. It is sold in various sizes, ranging from 1 layer of leaves with 2 buds to 3 layers of leaves with 15+ buds, in pot sizes ranging from 14 cm to 30 cm. Check carefully that the leaves are not damaged, do not show scorching (dark spots) and are free of mealy bug and brown scale. A storage and transport temperature of above 15°C is important. Medinilla requires a light position; in winter months the plant can even tolerate direct sunlight. Don’t place in full sun in the spring and summer because of leaf scorching. Water the plant moderately: the soil can dry out a bit between watering. It’s better to be a little too dry than too wet. The houseplant needs no food and does not need to be soaked. The larger sizes of Medinilla look fabulous as a solo plant on a pedestal or corner of an item of furniture. Enter the code at checkout to recieve your 10% off. ​Did you Read about Slowflowers.com in Modern Farmer? 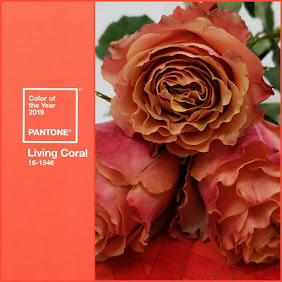 "Flowers grown in the United States are fresher and subject to stricter labor and environmental laws. So why do imported blooms dominate the domestic market?" Your Slow Flowers Membership helps us pay for public relations efforts to position Slowflowers.com as a content resource for print and digital media outlets. The payoff is often great media coverage that members may not be able to achieve individually, but that's entirely possible when we come together with a unified voice (and PR buying power). And like all good things, sometimes great press comes slowly - no pun intended! 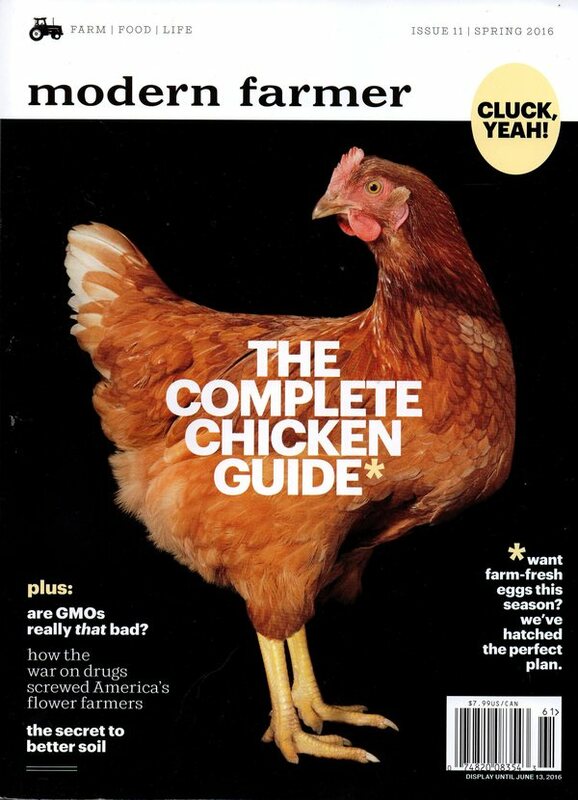 The Spring 2016 Modern Farmer article written by environmental journalist Kristine Wong is one example of how we nurture sustainable and meaningful relationships with the press, rather than take a shotgun approach to PR. This story's origins date to the fall of 2014 when Kristine agreed to meet with Slow Flowers founder Debra Prinzing for an informational briefing. The introduction was made by Lola Honeybone, who ran PR for the Slowflowers.com launch in 2014. From that simple cup of coffee in Oakland, Kristine's interest was piqued. We helped to connect her with a number of florists and flower farmers for background interviews. 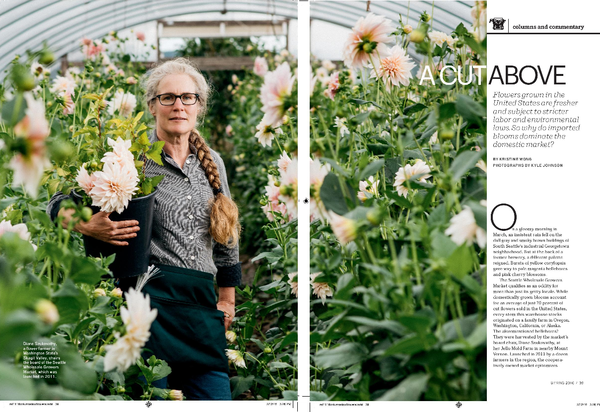 In February 2015, Kristine traveled to Seattle and we hosted her on a tour of Seattle Wholesale Growers Market where she met flower farmer Diane Szukovathy of Jello Mold Farm (pictured above in the Modern Farmer opening spread). In June 2015, Kristine attended the Field to Vase Dinner at our invitation, held at California Pajarosa in Watsonville, California. There, she met more Slowflowers.com members and learned about the Certified American Grown Program, a Slow Flowers partner. By August 2015, she let us know that Modern Farmer had commissioned a story (and as it turns out, we brokered her introduction to an editor there). From that point, we assisted in providing even more background material, contacts and resources as Kristine reported and wrote her story. 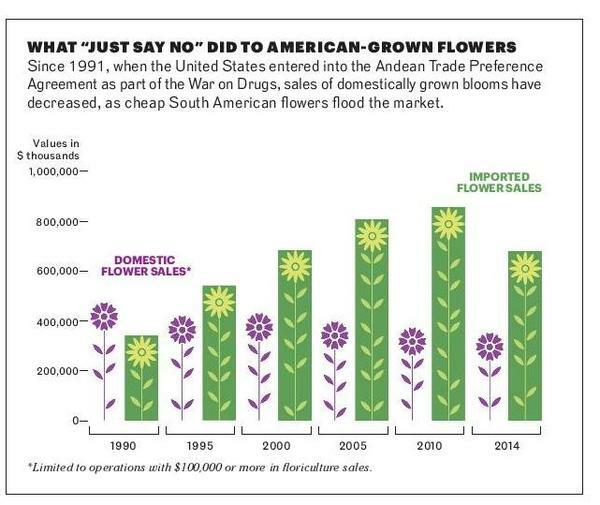 By March 15, 2016, the story hit the newsstands with a provacative coverline that reads: "How the War on Drugs Screwed America's Flower Farmers." Yikes! Well, sensational cover lines sell magazines, right? Inside is a comprehensive, very well-reported story that you'll want to read. In addition to Diane Szukovathy, Kristine quoted Debra Prinzing, creator of Slowflowers.com, and she interviewed Kasey Cronquist of Certified American Grown/Field to Vase Dinner Tour, Fair Field Flowers of Wisconsin and Molly Culver of Molly Oliver Flowers based in Brooklyn. As of Spring 2016, we have activated the Event Section on Slowflowers.com. This feature appears in a scroll-down menu on the home page's top navigational bar by category. 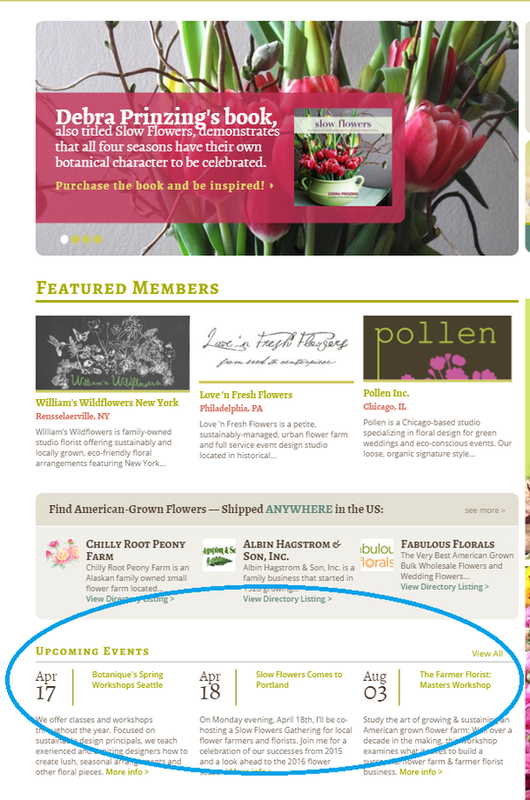 Gain attention when you add your Floral Design Class, Flower Farming Workshop or Meet-Up to our Event Section. This feature is $15-per-month and Premium Members receive one FREE Event Listing each month. Follow the link below to learn more details and add your event today! Sign Up Here. 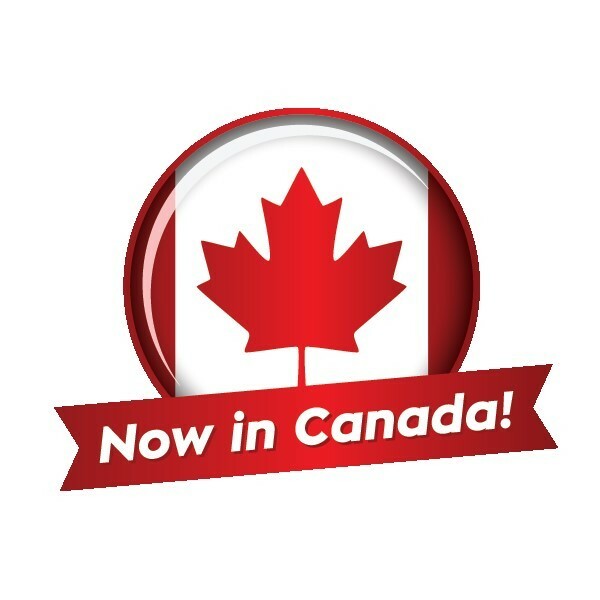 Consumers in search of local, seasonal and sustainable blooms from Canadian flower farms and floral designers can now visit Slowflowers.com and be assured of the Canadian origins of each stem they purchase. Ten Canadian floral businesses joined the launch, with the goal of connecting flower lovers to retailers, designers, studios and farms that supply and sell locally-grown and Canadian-grown flowers. The announcement generated some great reporting from Kathy Renwald, a writer for The Hamilton (Ontario) Spectator. 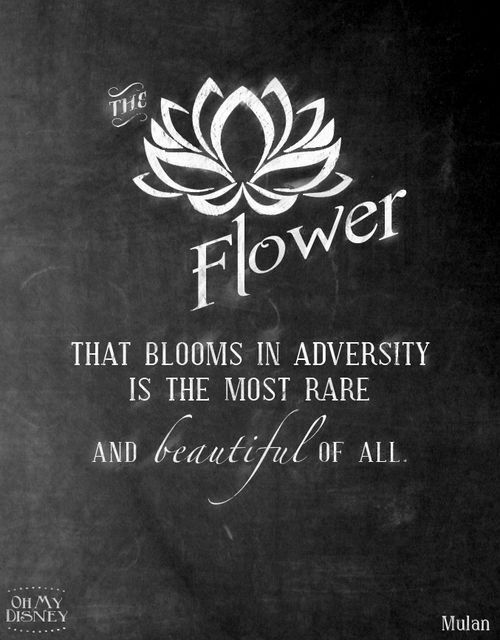 Click on the link below to read her story, titled "Slow, Seasonal Flowers Have Their Day." Join the Slow Flowers 1,000 Campaign! There are nearly 700 members who have added their Floral businesses on Slowflowers.com, but we know there are so many others who follow us on Instagram, Twitter and Facebook, frequently using the #slowflowers hashtag to indentify their brand. 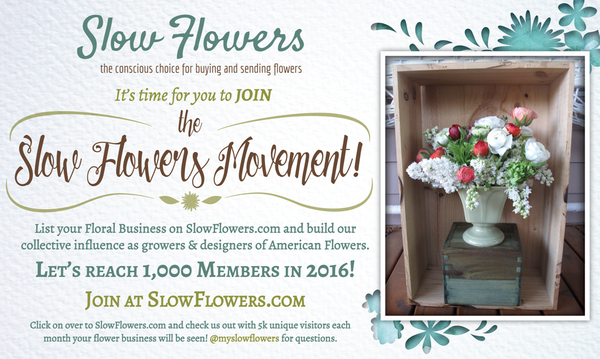 Our goal is to recruit those flower farms, floral designers and farmer-florists to add their support to the Slow Flowers Movement and grow Slowflowers.com to 1,000 members! Why is this important? It will give us a more credible presence with the media, with policymakers and with consumers -- that's why! If you want to help, download this graphic seen above (we have Instagram and Facebook versions) and invite your friends and followers to get involved. Let's Grow the Movement! 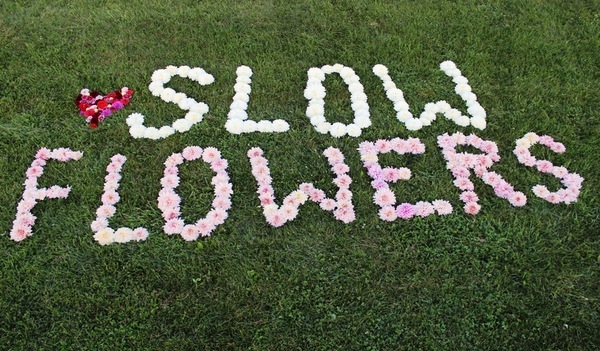 In the Slow Flowers Community, we value everyone's involvement in raising awareness for the domestic floral industry. Please take an active part in this group. You'll find that helping others allows you, in turn, to receive help for yourself. 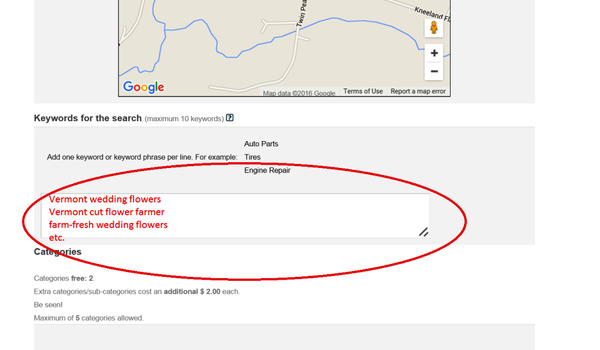 When you create your Slowflowers.comListing, there is an important field: KEY WORDS. We've noticed that many of you skip this field. Don't!!! up to 10 words/phrases to differentiate your business and attract those searching for you. 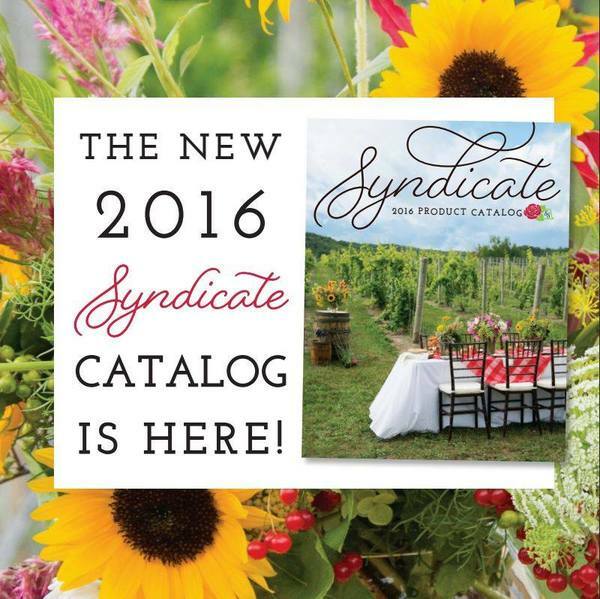 Syndicate Sales has joined Slowflowers.com as a major sponsor of the directory, the podcast and American Flowers Week 2016! 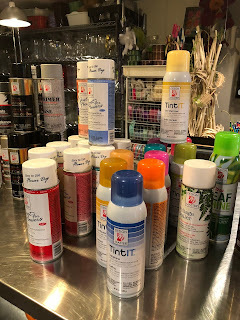 This American manufacturer of vases and accessories serves professional florists and event designers. Look for the American Flag Icon to find Syndicate's USA-made products. The spring edition 2016 of the Bouquet Tales newspaper is now available! In the growing colours edition you will find refreshing colour combinations that will help you create stunning and eye-catching bouquets. What to think of soft pastel that are brightened up with shiny yellow or splashing blue. Or go over the top with our more is more theme, colorful with an extreme mixture of textures and shapes. The online edition can be downloaded from bloomtube.com/bouquettales.